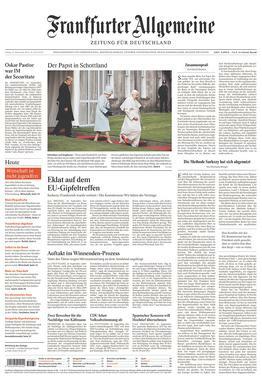 The Frankfurter Allgemeine Zeitung (German: [ˈfʁaŋkfʊɐ̯tɐ ʔalɡəˈmaɪnə ˈtsaɪtʊŋ], Frankfurt General Newspaper), abbreviated FAZ, is a centre-right, liberal-conservative German newspaper, founded in 1949. It is published daily in Frankfurt am Main. Its Sunday edition is the Frankfurter Allgemeine Sonntagszeitung (pronounced [-ˈzɔntaːksˌtsaɪtʊŋ], abbreviated FAS). The paper runs its own correspondent network. Its editorial policy is not determined by a single editor, but cooperatively by four editors. It is the German newspaper with the widest circulation abroad, with its editors claiming the newspaper is delivered to 148 countries. "Arising from the fact that some of our colleagues previously were members of the Frankfurter Zeitung, it often has been suggested an attempt was being made here to be the successor to that newspaper. Such an assumption misjudges our intentions. Like everyone, we too are astonished at the high quality of that paper; …however, showing respect for an amazing achievement does not imply a desire to copy it." —  FAZ Editorial board, Dohrendorf, 1990. Until 30 September 1950 the F.A.Z. was printed in Mainz. Traditionally, many of the headlines in the F.A.Z. were styled in orthodox blackletter format and no photographs appeared on the title page. Some of the rare exceptions were a picture of the celebrating people in front of the Reichstag in Berlin on German Unity Day on 4 October 1990, and the two pictures in the edition of 12 September 2001 showing the collapsing World Trade Center and the American president George W. Bush. In the early 2000s, F.A.Z. expanded aggressively, with customized sections for Berlin and Munich. An eight-page six-day-a-week English-language edition was distributed as an insert in The International Herald Tribune (which is owned by The New York Times Company); the articles were selected and translated from the same day's edition of the parent newspaper by the F.A.Z. staff in Frankfurt. However, F.A.Z. group suffered a loss of 60.6 million euros in 2002. By 2004 the customized sections were scrapped. The English edition shrank to a tabloid published once a week. On 5 October 2007, the F.A.Z. altered their traditional layout to include color photographs on the front page and exclude blackletter typeface outside the nameplate. Due to its traditionally sober layout, the introduction of colour photographs in the F.A.Z. was controversially discussed by the readers, becoming the subject of a 2009 comedy film that was still current three years later. Currently, the F.A.Z. is produced electronically using the Networked Interactive Content Access (NICA) and Hermes. For its characteristic comment headings, a digital Fraktur font was ordered. The Fraktur has since been abandoned, however, with the above-mentioned change of layout. After having introduced on 1 August 1999 the new spelling prescribed by the German spelling reform, the F.A.Z. returned exactly one year later to the old spelling, declaring that the reform had failed to achieve the primary goals of improving language mastery and strengthening the unity of the language. After several changes had been made to the new spelling, F.A.Z. accepted it and started using it (in a custom version) on 1 January 2007. Its political orientation is centre right and liberal-conservative, occasionally providing a forum to commentators with different opinions. In particular, the Feuilleton and some sections of the Sunday edition cannot be said to be specifically conservative or liberal at all. In the 2013 elections the paper was among the supporters of the Christian Democrats. 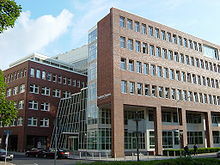 It has the legal form of a GmbH; the independent FAZIT-Stiftung (FAZIT Foundation) is its majority shareholder (93.7%). The FAZIT-Stiftung was born in 1959 by the transformation of the then FAZ owner "Allgemeine Verlagsgesellschaft mbH" into a private foundation. The FAZIT-Stiftung is 'owned' by up to nine persons who can't sell or buy their share but have to transmit it free of charge to a successor which is co-opted by the remaining shareholders. The foundations statute prescribe that only such persons shall be co-opted as new member, who "by their standing and personality" can guarantee the "independence" of the FAZ. The current group of seven is composed of active or former CEOs, company owners, board members, and corporate lawyers. The FAZIT foundation also owns more than 90% of the shares of the company 'Frankfurter Societät' which in turn is owner of the printing enterprise 'Frankfurter Societätsdruckerei' and the regional paper Frankfurer Neue Presse. The F.A.Z. is one of several high-profile national newspapers in Germany (along with Süddeutsche Zeitung, Die Welt, Die Zeit, Frankfurter Rundschau and Die Tageszeitung) and among them has the second largest circulation nationwide. It maintains the largest number of foreign correspondents of any European newspaper (53 as of 2002). The F.A.Z. had a circulation of 382,000 copies during the third quarter of 1992. The 1993 circulation of the paper was 391,013 copies. In 2001 it had a circulation of 409,000 copies. The F.A.Z. had a circulation of 382,000 copies in 2003. The 2007 circulation of the daily was 382,499 copies. The 2016 (IVW II/2016) circulation of the daily was 256,188 copies. In December 1999, future German Chancellor Angela Merkel published a sensational article in the Frankfurter Allgemeine Zeitung, lamenting the ‘‘tragedy’’ that had befallen the party (CDU donations scandal), blaming former Chancellor Helmut Kohl and urging a new course. In 2006, the F.A.Z. was banned in Egypt for publishing articles which were deemed as "insulting Islam". The paper was again banned in Egypt in February 2008 due to the publication of Prophet Mohammad's cartoons. In November 2012, the paper provoked strong criticism in Spain because of its stance against Spanish immigration to Germany during the economic crisis. ^ a b Ruud Koopmans; Barbara Pfetsch (May 2007). "Towards a Europeanised Public Sphere? Comparing Political Actors and the Media in Germany" (PDF). Centre for European Studies. Oslo. Archived from the original (Report) on 19 December 2014. Retrieved 19 December 2014. ^ a b Georg Hellack (1992). "Press, Radio and Television in the Federal Republic of Germany" (Report). Inter Nationes. Retrieved 3 April 2015. ^ "World Press Trends" (PDF). WAN IFRA. Retrieved 4 April 2015. ^ Sigurd Hess (2009). "German Intelligence Organizations and the Media". Journal of Intelligence History. 9 (1–2). doi:10.1080/16161262.2009.10555166. ^ Rüdiger Dohrendorf (1990) [First published in 1990 as the author's doctoral thesis at the University of Hamburg]. Zum publizistischen Profil der Frankfurter Allgemeinen Zeitung: computerunterstützte Inhaltsanalyse von Kommentaren der FAZ [On the media profile of the Frankfurter Allgemeinen Zeitung: computer-aided text analysis of commentary in the FAZ]. Europäische Hochschulschriften, Reihe XXII, Soziologie; Bd. 204. (in German). Frankfurt am Main: Lang. p. 9. ISBN 9783631431795. OCLC 25676477. Aus der Tatsache, daß einige unserer Mitarbeiter früher der Redaktion der ‚Frankfurter Zeitung‘ angehört haben, ist vielfach geschlossen worden, hier werde der Versuch gemacht, die Nachfolgeschaft dieses Blattes anzutreten. Eine solche Annahme verkennt unsere Absichten. Wie jeder, so haben auch wir die hohen Qualitäten dieses Blattes bewundert; … Aber der Respekt vor einer hervorragenden Leistung bedeutet noch nicht den Wunsch, sie zu kopieren. ^ a b Landler, Mark (19 January 2004). "MEDIA; Woes at Two Pillars of German Journalism". The New York Times. Retrieved 2 February 2015. ^ "FAZ English Edition Debuts With the IHT". The New York Times. 3 April 2000. Retrieved 2 February 2015. ^ Jakobs, Hans-Jürgen (17 May 2010). "Und sie dreht sich doch" [And she in fact does change]. Süddeutsche Zeitung (in German). Retrieved 2 February 2015. ^ "Die "FAZ" ruft zur Konterrevolution auf" (26 July 2000). Der Spiegel. Spiegel.de. Retrieved 28 November 2016. ^ Giersberg, Dagmar (December 2007). "Chronicle of a Long Debate: The Spelling Reform". Translated by Hillary Crowe and Heather Moers. Goethe-Institut. Archived from the original on 18 December 2013. Retrieved 2 February 2015. ^ Juan P. Artero (February 2015). "Political Parallelism and Media Coalitions in Western Europe" (PDF). Reuters Institute for the Study of Journalism. Archived from the original (Working paper) on 16 April 2015. Retrieved 8 April 2015. ^ Peter Humphreys (1996). Mass Media and Media Policy in Western Europe. European Policy Research Unit series. Manchester University Press. p. 82. ISBN 9780719031960. OCLC 33008396. Retrieved 29 October 2014. ^ Adam Smith (15 November 2002). "Europe's Top Papers". campaign. Retrieved 5 February 2015. ^ "Profile. FAZ". Presseurop. Retrieved 26 February 2013. ^ "Science News? Overview of Science Reporting in the EU" (PDF). EU. 2007. Retrieved 5 October 2013. ^ Smale, Alison (30 October 2012). "The Making of Angela Merkel". The New York Times. Retrieved 2 February 2015. ^ "The impact of blasphemy laws on human Rights" (Policy Brief). Freedom House. Retrieved 29 September 2013. ^ "Aumenta el rechazo y temor a la 'avalancha' de españoles en Alemania". El Mundo. 19 November 2012. Retrieved 26 February 2013. Wikimedia Commons has media related to Frankfurter Allgemeine Zeitung.